The Georgia Smart Communities Challenge hosts a workshop to invite participants to apply for the 2019 program. 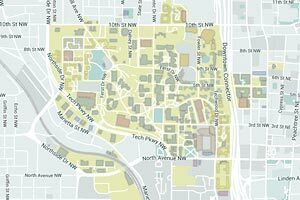 Georgia Tech and the Atlanta Police Department use publicly-available data to optimize the city’s officer patrol zones. The $25,000 grant will help Corbett, a Ph.D. student in Digital Media, to complete his dissertation on trust, technology, and community engagement. Georgia Tech Researchers have developed a new method for connecting a series of 3D reconstructions in to 4D model. Jennifer Hirsch, director of Tech's Center for Serve-Learn-Sustain, talks about her participation on the steering committee for the Resilient Atlanta initiative. Thad Starner named to prestigious CHI Academy. A new exhibit at the Museum of Design Atlanta features projects from the Public Design Workshop, a design research studio led by Ivan Allen College School of Literature, Media, and Communication Associate Professor Carl DiSalvo. College of Computing researchers control smartwatches with breaths and taps. A team of researchers found that, for many adolescents, online personal health records are expected as an active component of their health care. 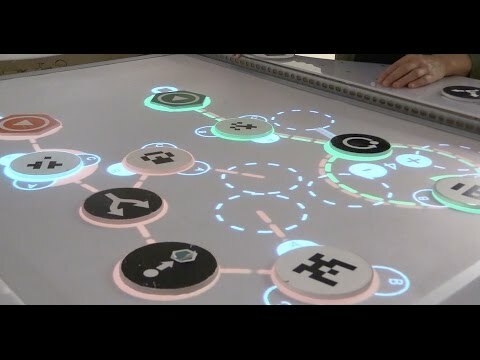 A musical, interactive tabletop teaches the basics of computer coding. Volunteer families are needed to test new app that tracks childhood development milestones. The White House highlights EarSketch, a Georgia Tech project that teaches coding to diverse audiences through music. Foley Scholar finalists Stevie Chancellor and Tesca Fitzgerald address physical challenges by participating in powerlifting. GT Computing students Maia Jacobs and Aditi Dhar are working on a mobile application that will help guide patients through their challenging journeys with breast cancer. Study examines 29 million tweets surrounding four recent Black Lives Matter events. Low-income parents are less likely to access free online educational resources or, when they do, they do so less effectively because of differences in motivation and parenting practices. Professor surprises students by using computer as a teaching assistant. Even in an age of tweets, texts, and video chats, young people are willing to use their voice to support and shape the communities in which they live. Algorithm allows computer to scan 26 hours of video in three hours to create a highlight reel. The pro-eating disorder community outsmarted Instagram censors in order to continue sharing content. Researchers have developed a database of more than 10 million newspaper pages that is helping researchers see history with spatial information that hadn’t been available before. Andrew W. Mellon Foundation has awarded the Georgia Institute of Technology a $1 million grant for a new learning center that will serve as an innovation engine driving digital humanities education and scholarship. 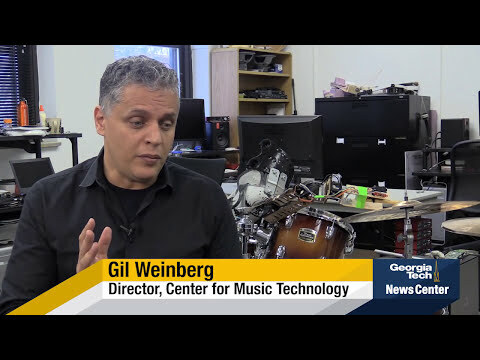 A new wearable robotic limb allows drummers to play with three arms. Researchers from Interactive Computing unveil “Quixote” to teach AI positive behavior. A new lab on campus will allow scientists around the country to upload programs and run experiments remotely. New algorithm teaches how to react to a variety of falls to minimize damage. Following celebrity suicides, Redditors show expressions that indicate increased and explicit suicidal tendencies. Georgia Tech’s stories of nerdy inspiration at the nation’s premier science fiction, fantasy, and pop culture fan convention. More than 40 researchers and students from across Georgia Tech will attend a premier international robotics event next week in Seattle – the IEEE International Conference on Robotics and Automation (ICRA 2015). Online personas change after people announce their wedding engagement on Twitter. Georgia Tech Alumnus James O’Brien receives Academy Award for Technical Achievement in realistic animated destruction. IPaT Executive Director Beth Mynatt will represent Georgia Tech today at the launch of President Barack Obama's Precision Medicine initiative. Kathy Pham is among the 22 people the White House invited to hear President Obama’s speech from the first lady’s box. A student and team of robots collaborate on an original, Miles Davis-inspired composition. Inventions expand our assumed notion of what constitutes an instrument and the sounds it can produce. Professors Mark Guzdial and Shamkant Navathe were among 47 computer scientists selected as fellows of the Association for Computing Machinery (ACM) this week for their innovations in the field. Ashok Goel, professor in the School of Interactive Computing, will use IBM's Watson computer in his Computational Creativity course. Georgia Tech recently announced the appointment of Richard Henneman as the new director of its interdisciplinary MS program in Human-Computer Interaction (MS-HCI) and as professor of the practice in the School of Interactive Computing. The Data Science for Social Good internship program is sponsored by Georgia Tech and Oracle. By creating proactive, accessible health and wellness technologies, Georgia Tech has taken significant steps in enabling people to control their own health to greater, more effective degrees. 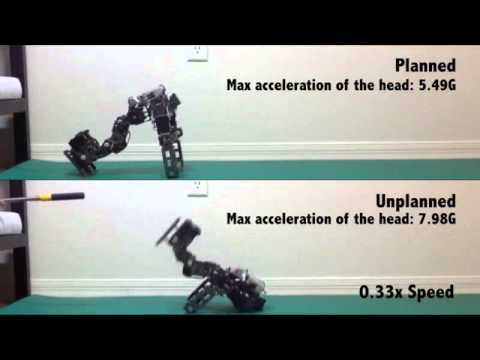 A new robotic prosthesis controls two drumsticks for an amputee. In the age of mashups, fan fiction and content sharing, online media creation has spurred new complexities in copyright, effectively turning the legal concept of “fair use” on its ear, according to a new study from Georgia Tech. Study examines how politically active Facebook users interact with some but ignore others. Will You Share Your Opinion of Obama on Facebook? Study explores cultural differences of future wearable technology. The Georgia Tech has received a five-year $4.6 million grant to increase understanding of the aging process for people with disabilities and use data gleaned from the study to develop technologies that will benefit them and others. A common myth today is that young people are all glued to the Internet, but in fact, only 30 percent of the world’s youth population between the ages of 15 and 24 years old have been active online for at least five years. The School of Industrial Design Wins Two Awards at the International Symposium on Wearable Computers. Fitness-Tracking Data: Useful Tool or Dangerous Obsession? Can Playing Games Keep You Safe Abroad? Would You Announce Your Email Habits? News as Games: Immoral or Future of Interactive Journalism? Glove Can Make You Mozart? Workplace Gossip: Is All Gossip At The Office Bad Gossip?